The communities that formed on South Whidbey Island at the turn of the 20th century were comprised of small gathering areas that centered around a school, post office, church, dance pavilion, and/or supply store. Most of the communities that survived and transformed to our modern towns were those near the water that had built a successful pier and could offer cord wood and water to the small steamships that traversed the Puget Sound waters. As there were no roads that initially joined these communities, most were connected via the Mosquito Fleets ships, such as the Fairhaven, Whidbey I, and a number of small launches that plied the waters around the island. The initial roads that formed were not much more than trails through the woods that followed Indian footpaths or logging roads. The County Commissioners awarded the construction of new or widened roads upon the petitions of residents looking for faster and safer routes through the woods for their wagons and for their children to walk to school. Those early roads form the basis of the initial road network that linked these communities together before the construction of the spine road through the middle of the island in the 1920’s. 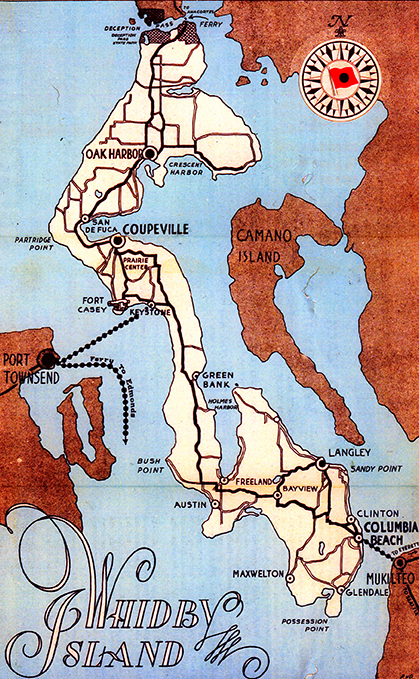 The circa 1920’s map on the right shows both the initial patchwork or roads and the newly constructed spine road to accommodate the increasing demand of motor vehicles before the opening of the Deception Pass Bridge in 1935. Austin is a community on Mutiny Bay on the southwest side of Whidbey Island two miles south of Freeland. A post office was established on April 27, 1901 and operated until January 31, 1940. The place was named for Austin F. Marshall, son of Thomas H. Marshall the first post master. (Ramsey, Island County, p. 25). A scattered settlement and school district on southern Whidbey Island is two miles north of Useless Bay in southeast Island County. The name is descriptive, as it overlooks Useless Bay. (Meany, p. 15). A wooded, west shore point projecting a half mile beyond the general shoreline of Whidbey Island, north of Mutiny Bay and three miles east of Freeland, Island County. In 1841, it was named Point Leavett by Cmdr. Charles Wilkes for a member of his crew. In 1855, it was changed by U.S. Coast Survey for the point’s heavy growth of trees and bushes. Clinton is a community near the southeast point of Whidbey Island, directly north of Columbia Beach on Possession Sound in southern Island County. It was named for Clinton County, Iowa, by Edward C. Hinman who came from Iowa in 1883 and filed a timber claim. He built a hotel and a steamer landing, supplying steam ships with wood and water. A post office was established in the 1880s two miles from Clinton and was called Phinney for a Seattle land promoter. In the 1890s, it was moved to Clinton and took the name of Clinton. Freeland is a town on the south shore of Holmes Harbor on Whidbey Island in southern Island County. The name is for the Free Land Association, a cooperative and somewhat socialistic organization which founded the town in 1900. The site had been platted previously by real estate promoters as St. Louis, but no town resulted. At one brief period the place was called Newell, which was a post office name only. (Ramsey, Island County, p. 25). Glendale is a community on the southeast tip of Whidbey Island two and a half miles north of Possession Point in southern Island County. It was named by Mrs. E. M. Peck, in 1907 who felt that the name expressed the beauty of the locality. (Meany, p. 97). Greenbank is on the east shore of Whidbey Island at the west entrance to Holmes Harbor in southern Island County. The name was chosen in 1906 by Calvin Phillips of Seattle for his boyhood home in Delaware. (Meany, p. 103). The post office at Useless Bay on the southwest end of Whidbey Island was called Useless when established in 1883. Since such a name was thought inappropriate as a designation, agitation in 1893 got the name changed to Island. The place is nine miles northwest of Clinton and the post office was closed in 1905. (Ramsey, Island County, p. 24). Langley is a community on the southeast shore of Whidbey Island, on Saratoga Passage in south Island County. It was named for Judge J. W. Langley of Seattle, a member of a company which platted the townsite in 1890. (Cardle, p. 46). Maxwelton is a community near the southwest tip of Whidbey Island at the south entrance to Useless Bay in southern Island County. The place was named by two Scottish residents, the McKee brothers, for the bonnie bra’es of Maxwellton. Either the McKees or the cartographers did not know how to spell the Scottish name. Newell was a small community and post office two and a half miles northwest of Clinton on Whidbey Island in Island County. Willis George and Ellen Newell settled there and the post office operated between 1895 and 1904. Possession Point is the southern tip of Whidbey Island at the entrance to Possession Sound in south Island County. It was named by Capt. George Vancouver on June 4, 1792. An unofficial name is Skagit Head. There was a post office at Possession Point between 1923 and 19542 (Ramsey, Island County, p. 29). Saratoga is a community on the southeast shore of Whidbey Island four miles northwest of Langley in Island County. The post office was established in 1907 and was discontinued in 1927. (Ramsey, Island County, p. 28). A post office named Skagit Head was established on or near the southern tip of Whidbey Island in Island County by J.I. Turner in 1858. (Ramsey, Island County, p. 8). The post office of Useless was at the had of Useless Bay nine miles west of Clinton on Whidbey Island. The post office was established October 17, 1883 and was changed to Island on May 5, 1893. Useless post office was at the site of the Stetson-Post logging camp and was looked upon as a joke by the lumbermen and loggers of the region. (Ramsey, Island County, p. 13).